As the world's second biggest-selling laptop vendor, Acer's comprehensive range covers almost all sectors of the market. Its Aspire 5935G-664G50Mn is a fantastic consumer offering that combines power, mobility and usability with a stylish design. 3D performance is this machine's key strength. Despite being outperformed by the Toshiba Satellite L555-10R and Samsung R720 (Blu-ray), ample power for home multimedia use is on offer. Whether editing photos or videos or playing games, you will be well equipped for most graphics tasks. A lower-powered Intel GPU is also fitted and you can switch between the two, on the fly, to prioritise mobility over power when necessary. The Nvidia GT240M chip gives 213 minutes of battery power and by switching to the Intel chip, a further 51 minutes of mobility is provided. Home and office performance is less notable, but there is still plenty of power on offer for most family use, and the dual-core Intel T6600 processor makes it easy to multi-task. The stunning 15.6-inch widescreen panel adds to the appeal and offers bright, sharp and vibrant images. Colour and contrast are generally strong, although images can appear slightly washed out at times. An HDMI port lets you connect to an HDTV when back at home, for a bigger picture. While the black chassis lacks an eye-catching colour scheme, its sleek look and blue lighting create an elegant design for the home or office. Resilient build quality is shown throughout, with sturdy plastics used, although the glossy lid is a magnet for fingerprints and smudges. The keyboard uses a design common to Acer laptops, whereby each key is individually raised above the chassis. Usability is excellent, with all keys moving smoothly and accurately, but dust and dirt can easily collect beneath the keys. The large touchpad is equally usable and provides gesture-control functionality. Images can be zoomed and documents scrolled with an easy pinch or swipe of your fingers. The mouse buttons are far less accessible, requiring a frustratingly precise click to register successfully. Rounding out the impressive specification is a capacious 500GB hard drive, it will easily hold a family's files. A biometric fingerprint scanner is also in place to protect your data from prying eyes. Providing impressive performance without sacrificing mobility, the Aspire 5935G-664G50Mn satisfies the key requirements of a modern laptop. 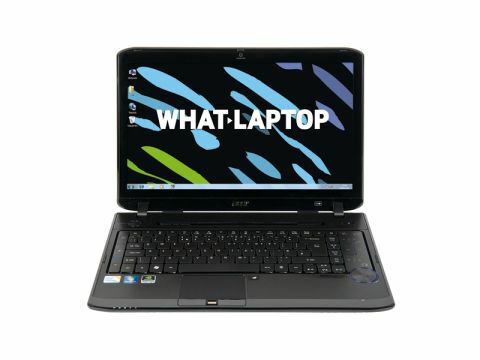 Add the impressive specification, great usability and vibrant screen and you've got a great laptop for the whole family.